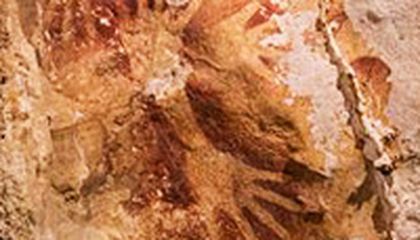 Ancient cave drawings in Indonesia are as old as famous prehistoric art in Europe. That's according to a study that shows our ancestors were drawing all over the world 40,000 years ago. Archaeologists have calculated that a dozen stencils of hands in mulberry red and two detailed drawings of an animal described as a "pig-deer" are between 35,000 to 40,000 years old. The age is determined by the levels of decay of the element uranium. That puts the art found in Sulawesi, southeast of Borneo, in the same rough time period as drawings found in Spain and a famous cave in France. 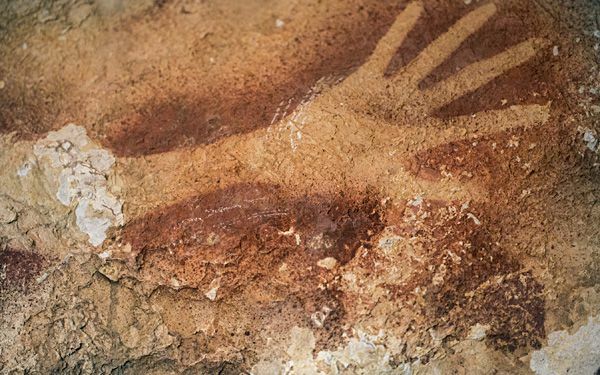 And one of the Indonesian handprints, pegged as at least 39,900 years old, is now the oldest hand stencil known to science, according to a study published Wednesday in the journal Nature. These are more than 100 Indonesian cave drawings that have been known since 1950. In 2011, scientists noticed some strange outcroppings, called "cave popcorn," on the drawings. Those mineral deposits would make it possible to use the new technology of uranium decay dating to figure out how old the art is. So they tested the cave popcorn that had grown over the stencils that would give a minimum age. It was near 40,000 years. "Whoa, it was not expected," recalled study lead author Maxime Aubert, an archaeologist and geochemist at Griffith University in Australia. Looking at the paintings, the details on the animal drawings are "really, really well-made," Aubert said in a phone interview from Jakarta, Indonesia. "Then when you look at it in context that it's really 40,000 years old, it's amazing." Paleoanthropologist John Shea of Stony Brook University in New York, who wasn't part of the study, called this an important discovery that changes what science thought about early humans and art. Before this discovery, experts had a Europe-centric view of how, when and where humans started art, Aubert said. Knowing when art started is important because "it kind of defines us as a species," he said. Because the European and Asian art are essentially the same age, it either means art developed separately and simultaneously in different parts of the world or "more likely that when humans left Africa 65,000 years ago they were already evolved with the capacity to make paintings," Aubert said. Ancient art hasn't been found much in Africa because the geology doesn't preserve it. Shea and others lean toward the earlier art theory. "What this tells us is that when humans began moving out of Africa they were not all that different from us in terms of their abilities to use art and symbol," Shea said in an email. Critical thinking challenge: How does this discovery change the Europe-centric view of how, when and where humans started art? It's amazing that no matter how many years pass, there seems to constantly be an array of things that haven't been discovered yet. This was something that changed how explorers, and just everyone really, thought art had been started by humans. It was something that was constantly changing, but it seems that the movement of people changed where and even when drawings and art started. There's also the fact that this art was really well done. I think that's really cool as well.I bet it's worth a lot of money. No I can't draw better. I'm terrible at drawing. So no I can't and that's amazing that people way back then could draw its a signal that the artistic creativity of humanity started long before we came along. It changes because people would always think that art started in the medieval times. Like, when Donatello was making his art. That's when a lot of people (not all) thought that's when the first recording of art has been documented. It changes our view because we know that it happened before the Medieval times. This discovery shows that people created art way earlier than previously thought. It also shows that it started in a different place than originally thought. Scientist also now think that humans moved to Europe and Asia already with the ability to make art. It gave the people of today a better understanding of where they were creativity wise many years ago and also showed them how creativity evolved to what it is today. We originally thought that art started in Europe and Asia, but now we know that it was probably started earlier in Africa and then spread to other parts of the world. We can't find these painting in Africa because of its geology, which does not save the work. Knowing that it started long ago defines us as a species because we all knew to draw and communicate with art. I'm not sure that it really does change their view but, art was most likely started earlier than they expected it to. I believe that humans started art by writing in their native languages on caves with ink or whatever it was that they wrote with, and then they just decided to go beyond that by making symbols and so on. It tells us that Europe was not the only area of the world was drawing art back then. This shows that their creativity started at either nearly the same time or could have came from the same place. It changes it by people finding out that artwork goes down that many years because it is always good to get a different perspective of things from the past. the point of view as of way back then it also helps people get positive energy and it helps them get creative. Now that we know humans everywhere thought it would be smart to find a way that allows them to communicate with others through writing. Also this means that when people left Africa they probably taught others how to do the things they could do. Now we know that people back in the very early times learned to do these things and it may not have been as recent as we thought. We now believe that art could have started in Africa because there is some of the oldest art in that area.